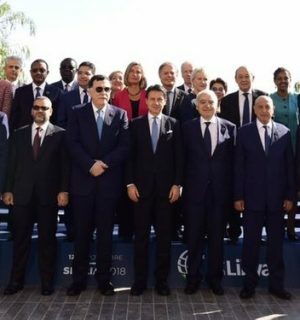 The Palermo Libya conference made no major breakthrough but reiterated previously agreed principles such as the LPA, the Paris agreement and UNSMIL’S Action Plan (Photo: Italian government). More prominence was given to that Action Plan’s National Conference (Multaqa) to be held early 2019, with a commitment to implementing its outcomes. The conclusions stressed the National Conference was not a new body replacing existing LPA bodies. There was also a commitment to passing the electoral law and permanent constitution- with elections now pushed back to the second quarter of 2019. The conclusions committed to the unification of all of Libya’s state institutions including its armed forces. There was also an offer to help rebuild Libya’s regular security forces. “On November 12-13, 2018, Libya and International partners met in Palermo, under the auspices of the United Nations and in the wake of the Paris Conference of May 29, 2018. Participants welcomed the meeting in Palermo as a useful platform to show the unity of the international community in supporting the Libyan-owned stabilization process. They acknowledged Sicily as a crossroad of different cultures and as a symbol of the common engagement in reaching out to the southern Mediterranean and to Libya. Participants included a broad Libyan presence, with delegations from PC/GNA, HOR, HSC and LNA. Countries invited included representatives of Algeria, Austria, Canada, Chad, China, Czech Republic, Egypt, Ethiopia, France, Germany, Greece, Italy, Jordan, Malta, Morocco, the Netherlands, Niger, Poland, Qatar, Republic of Congo, Russia, Saudi Arabia, Spain, Sudan, Sweden, Swiss Confederation, Tunisia, Turkey, the United Arab Emirates, the United Kingdom, the United States of America, the African Union, the European Union, the League of Arab States, the World Bank, the International Monetary Fund, and the United Nations. Welcomed the statements by all Libyan delegations and the SRSG Ghassan Salamé, and highlighted the following principles and commitments. Welcomed the briefing presented by SRSG Salamé to the UN Security Council on November 8, 2018, in which he called for a Libyan-led inclusive National Conference to be held in the first weeks of 2019 in Libya. Underlined the importance of concluding the subsequent constitutional framework and electoral process by Spring 2019. Stressed the determination to follow closely and assess the implementation of the commitments made in Palermo. Respect the results of these elections when they occur, while those who will undermine Libya’s security or obstruct the electoral process will be held accountable. Stressed the need to step up coordination of regional and international efforts to tackle the common migration challenge and fight against human trafficking, in full respect of national sovereignty and international human rights law. Called for the relevant international organizations to provide the Libyan authorities with expertise and technical support to achieve these goals. Implement the agreement on the terms of reference for the financial review of the Central Bank of Libya and its eastern parallel branch and to work toward the reunification of the economic institutions, through UNSMIL-facilitated dialogue. Participants recalled that any solution to the Libyan crisis can only be a peaceful and political one, in full respect of Libyan sovereignty and a national reconciliation process involving all Libyans who are willing to participate and peacefully contribute to the Libyan transition.